A meerkat handler, monkey expert, and llama-keeper, oh my! 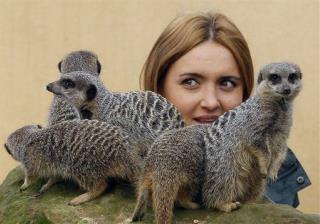 (Newser) – Finally, legal closure in a tumultuous zookeeper love triangle across the pond—and perhaps the best lead-in sentence you'll read all week: "A former meerkat expert at London Zoo was cleared Tuesday of assaulting a monkey handler in a love spat over a llama-keeper" is how the AP describes the British High Court's reversal Tuesday of the conviction of Caroline Westlake (the meerkat expert), accused of assaulting Kate Sanders (the monkey handler) at a 2014 Christmas party. Both women had dated Adam Davies (the llama-keeper), and Westlake was said to have hit Sanders in the face with a wineglass after an argument. "A former meerkat expert at London Zoo was cleared Tuesday of assaulting a monkey handler in a love spat over a llama-keeper." That was the weirdest sentence I have ever read.